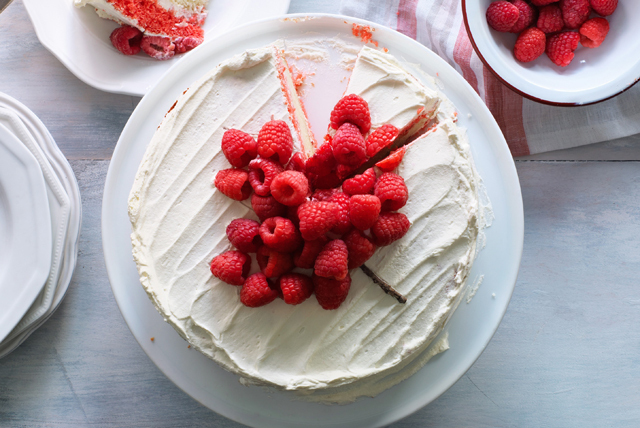 Make our red and white layer cake recipe at your next Canada Day celebration. Trace a maple leaf pattern on top of the cake and fill it with fresh raspberries. This cake recipe is sure to be a crowd pleaser on Canada Day! Grease and flour 2 (9-inch) round pans; cover bottoms with parchment. Prepare cake batter as directed on package. Pour half into separate bowl; stir in dry raspberry jelly powder. Pour batters into prepared pans. Bake 28 to 30 min. or until toothpick inserted in centres comes out clean. Cool cakes in pans 15 min. Remove to wire racks; cool completely. Mix yogurt and sugar in large bowl until blended; gently stir in Cool Whip. Reserve 2 cups Cool Whip mixture for later use. Stir raspberries into remaining Cool Whip mixture. Cut red cake layer horizontally in half; place 1 layer on plate. Cover with 3/4 cup raspberry mixture and white cake layer; spread with remaining raspberry mixture. Top with remaining red cake layer. Frost top and side of cake with reserved Cool Whip mixture. Refrigerate 2 hours. Prepare using Jell-O Strawberry Jelly Powder, and substituting sliced strawberries for the raspberries. Use toothpick to trace a maple leaf on top of frosted cake. Place 1 of the remaining raspberries on each leaf point, then fill in the leaf with remaining raspberries.